Since its invention in 1865 by Rev. Rasmus Malling-Hansen of Copenhagen, the modern typewriter has been upgraded quite a lot. 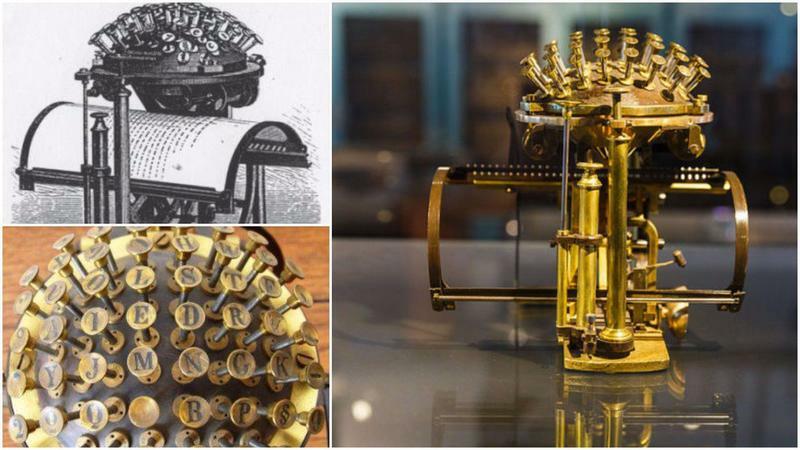 The Hansen Writing Ball, or "skrivekugle," was the very first commercially-produced typewriter. It went into production in 1870. Its fifty-two keys are arranged on what looked like half of a ball with a flat bottom. The keys which protrude from the ball are spring-loaded and worked the same as pistons. The Danish inventor experimented with porcelain models until he was satisfied with the final key placement, which was quite fast and easy to use. Malling-Hansen placed the most frequently-used letters where fingers would commonly be positioned to hold a pen. Consonants are positioned on the right side of the ball and the vowels on the left. Hansen's key placement was also inspired by a pianist’s ability to touch certain keys at high speed. Carbonized paper was used for the ribbon. Early models of the typewriter concealed the paper. You wouldn't see the document until it was complete. The paper was placed on a cylinder, and an electromagnetic battery moved the paper as the user typed. 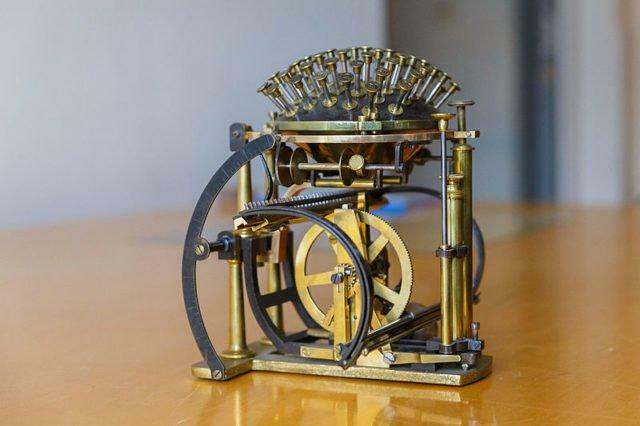 Malling-Hansen’s 1874 typewriter model used a flat mechanical paper frame instead of a cylinder but still the electromagnetic battery is incorporated to move the paper. By 1875, the battery was replaced by a mechanical escapement, and a downward curved paper frame replaced the flat frame. Also during this time spacing elements were added: a space bar, a line spacing, tabs for paragraphs or indented lines. A bell to signal the end of the line and a one-touch carriage return were also added. The 1875 model was made from brass and fit in a wooden presentation box, with a carrying handle for portability. It has been said that Malling-Hansen designed the typewriter to help blind people write, but according to his own journals, his primary motivation was speed. He wanted to make letter and document writing faster compare to hand writing with a pen. 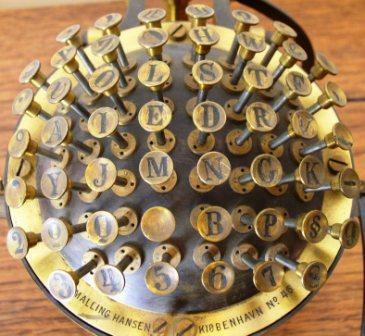 He did designed a writing ball with Braille incorporated onto the keys, but not until 1878. 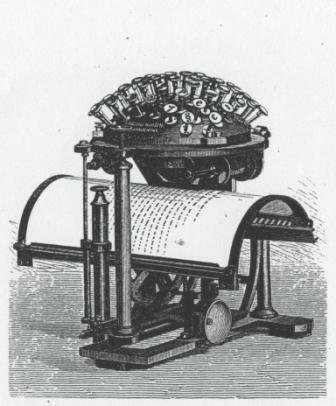 In 1877, another typewriter was invented by Sholes and Glidden, and further improved by James Densmore - the Remington 1. The new machine was mass produced and distributed in America by the Remington factory. The Remington 1 has a flat keyboard and uses the upstrike method. It was Sholes who introduced the QWERTY keyboard, wherein the most commonly used letters were placed at a distance from each other. Although the Hansen Writing Ball was superior to the Remington, Malling-Hansen was unable to compete with mass production. His last order for writing balls was canceled upon his death in 1890. It is believed that 180 Hansen Writing Balls were made and, of those, only four remain in private collections. Thirty more machines are off the market and can be found in different museums around the world. 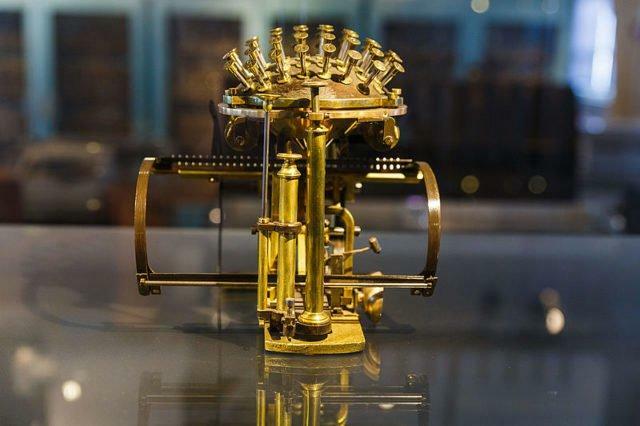 In the most recent private sale, an original Hansen Writing Ball with a serial number of 97, sold for $123,000; it is considered to be one of the most expensive antique typewriters in the world.